1. Say ‘NO’ to shaving. Rather, try other hair removal methods, such as waxing or laser treatment for your underarms. These will remove the hair strands from their roots, thereby lowering the frequency of hair removal and reducing the dark appearance significantly. 2. Keep your underarms clean by removing dirt, oil, and grime regularly. But make sure that you do not use soaps with harsh chemicals as those will cause darkness. 3. Exfoliate your underarms frequently in order to keep them free from dead skin cells. Exfoliating at least thrice a week is recommended for the best results. 4. Try natural home remedies to keep your sweat under control. 5. Replace your tight outfits with loose and breathable ones. The Xtreme Brite Brightening Gel is a highly concentrated gel formula that contains licorice extract, salicylic acid, glycolic acid, citric acid, and glycerin. All these ingredients cumulatively help in removing dead cells from the underarms while lightening and moisturizing them effectively. It is not just meant for the underarms but for the whole body. Apart from giving clearer and brighter underarms, it also removes blackheads and cosmetic acne and has anti-bacterial as well as soothing properties. The makers of the product claim that regular use of the gel, in combination with their Xtreme Brite Soap, will help you get rid of skin darkening and pigmentation in any part of the body. Price: Rs. 2699 for 30 gm. The Relumins Advance White Underarm And Thigh Cream is specially made for hard-to-whiten areas, such as underarms, inner thighs, elbows, knees, inguinal, etc., which tend to be darker than the rest of the body. It is an intense whitening professional formula, which includes active botanical ingredients (glutathione, arbutin, licorice, kojic acid, rosehip oil, etc.) for the safest and the most visible results. Arbutin is a miraculous skin whitener that leads to a naturally fairer skin while the micro-gel technology ensures the maximum absorption as well as controls the production of melanin. This cream also softens the skin as it lightens so that you always feel confident to put your hands up. Price: Rs. 4370 for 50 gm. The Garnier Mineral Light Extra Whitening Roll-On Deodorant not only absorbs all the odors from the underarms to give you all-day freshness and lasting confidence but it also whitens and lightens the parts effectively. The amazing formula contains absorbing mineralite and lemon extracts, which help in reducing dark spots from the armpits and minimize the appearance of the pores at the same time. The roll-on bottle comes with a skin tone strip through which the whitening effect of the product can be measured easily. The 6-in-1 roll on is alcohol-free and skin-friendly. Price: Rs. 130 for 50 ml. Price: Rs. 3200 for 50 ml. This underarm wash and whitening cream set by a Korean Company called the Nature Republic is specially made for treating dark armpits. The kit comes with an armpit wash that needs to be followed up by an armpit cream. The wash has exfoliating beads that help get rid of dead skin cells in our underarms while the cream whitens it to a great extent. It has a powdery finish and a pleasant fragrance too. Price: Rs. 700 for 80 ml. Loaded with natural extracts like Liquorice, Lemon Oil, Lavender Oil, Tea Tree Oil and Kojic Acid, Qraa Dark Underarm Whitening Cream is definitely one of the most affordable creams available in the market. Its unique formula treats the cause of darkness by reducing the production of melanin. It is also effective in treating dark spots, pimples and rashes. The product is all natural and without paraben, artificial color and fragrance. The product claims to deliver visible results within 10 days of use. Price: Rs. 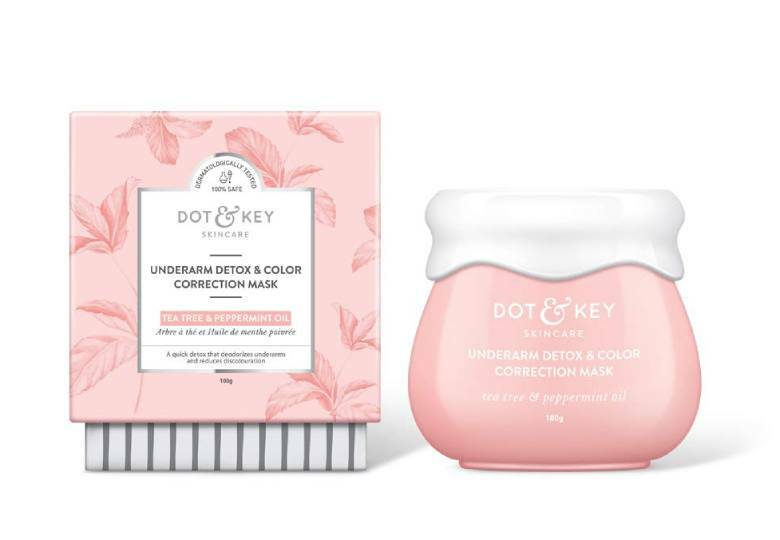 200 for 50 g.
Dot & Key Underarm Detox & Color Correction Mask is enriched with goodness of charcoal, jojoba and tea tree oils. When applied, the mask removes dead skin and impurities from the skin thus making your skin brighter and cleaner. The calcium-vitamin complex formula makes the skin smoother and softer as well. Price: Rs. 675 for 100 g.
Most of the commercially available underarm whitening creams contain a chemical called hydroquinone, which inhibits the production of melanin in our skin. But the prolonged use of hydroquinone, at the same time, causes a number of minor side effects, such as irritations, redness, itching, swelling, crusting, stinging, severe burning sensation, etc. as well as some adverse effects including exogenous ochronosis and even skin cancer. The market is flooded with synthetic bleaching products that claim to lighten, brighten, and whiten the underarms effectively. However, the long-term use of a chemical-laden product is not at all recommended. Hence, you must go through the list of ingredients used in a product or get in touch with your dermatologist before selecting the right solution for your dark armpits. Try to pick something that contains natural bleaching ingredients and not more than 2% hydroquinone. Also, be extra cautious about your underarm skin whitening product ingredients if you have a sensitive skin.